Cysts of the mediastinum constitute a small but important diagnostic group, representing 12%-30% of all primary mediastinal masses. Bronchogenic cysts are the most common cystic masses in the mediastinum. They are congenital lesions arising from abnormal budding of the primitive tracheobronchial tube, which subsequently differentiates into a fluid-filled, blind-ending pouch. More than a half of the patients are asymptomatic and are detected incidentally by radiographic imaging. Most of the bronchogenic cysts are located in the mediastinum, particularly subcarinal and right paratracheal. Bronchogenic cysts in these locations were predisposed to provoke compression symptoms. Especially large cysts may cause left atrial compression, esophageal compression, compression of the main bronchus, or vena cava syndrome. , We present a case of such large bronchogenic cyst in the posterior mediastinum mimicking ischemic cardiac pain. A 70-year-old man presented in our hospital with intermittent chest pain, dyspnea, dysphagia, and cough since 18 months. Clinical examination was unremarkable. The laboratory tests were without pathologic findings. The echocardiogram (ECG) demonstrated a well-known atrial fibrillation. In the past medical history the patient was treated for hypercholesterolemia, diabetes mellitus, arterial hypertension, and atrial fibrillation. In view of these cardiac risk factors and the possibility of an ischemic heart disease the patient underwent a cardiac catheter examination, but a coronary heart disease could be excluded. To proof other differential diagnoses, such as a thoracic aortic aneurysm or pulmonary diseases a chest computed tomography (CT) was requested, which revealed a 10.5 × 8 × 7 cm homogenous subcarinal mass with fluid density of the posterior mediastinum [Figure 1]a. There was no evidence of invasion of adjacent structures. The mass was seen to compress mainly the right main bronchus [Figure 1]b, the left atrium [Figure 1]b and c and the esophagus [Figure 1]c, accounting for the symptoms, such as dyspnea, palpitations, chest pain, and dysphagia, respectively. The typical features of the CT pattern (rounded/oval shape, fluid density (<20 HU)) allowing the diagnosis of bronchogenic cyst. Based on these findings and the general consensus that surgery has been advocated as the treatment of choice for symptomatic bronchogenic cysts, the patient was admitted for elective removal of the mediastinal mass. 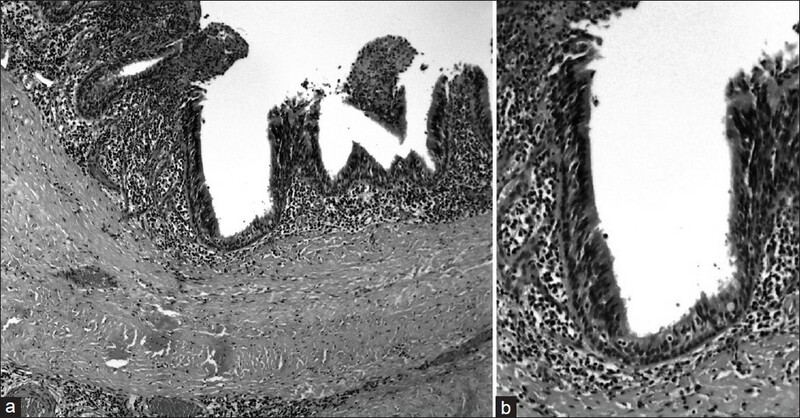 Histopathologic examination of the lesion showed a lining of respiratory epithelium associated with a wall containing smooth muscle, a finding that is characteristic of bronchogenic cyst [Figure 2]. After the cyst excision the patient was completely asymptomatic. 1. Wychulis AR, Payne WS, Clagett OT, Woolner LB. Surgical treatment of mediastinal tumors: A 40 year experience. J Thorac Cardiovasc Surg 1971;62:379-92. 2. Patel SR, Meeker DP, Biscotti CV, Kirby TJ, Rice TW. Presentation and management of bronchogenic cysts in the adult. Chest 1994;106:79-85. 3. Takeda S, Miyoshi S, Minami M, Ohta M, Masaoka A, Matsuda H. Clinical spectrum of mediastinal cysts. Chest 2003;124:125-32. 4. St-Georges R, Deslauriers J, Duranceau A, Vaillancourt R, Deschamps C, Beauchamp G, et al. Clinical spectrum of bronchogenic cysts of the mediastinum and lung in the adult. Ann Thorac Surg 1991;52:6-13. 5. Tiwari MK, Yadav R, Mathur RM, Shrivastava CP. Mediastinal bronchogenic cyst presenting with dysphagia and back pain. Lung India 2010;27:86-8. 6. Maier HC. Bronchiogenic cysts of the mediastinum. Ann Surg 1948;127:476-502. 7. Tireli GA, Ozbey H, Temiz A, Salman T, Celik A. Bronchogenic cysts: A rare congenital cystic malformation of the lung. Surg Today 2004;34:573-6. 8. McGlynn TJ Jr, Burnside JW, Gatenby RA. Symptomatic abdominal bronchogenic cyst mimicking acute ischemic heart disease. Heart Lung 1981;10:109-11.